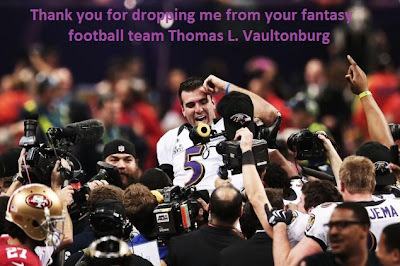 Zombie Logic From Thomas L. Vaultonburg, Outsider Poet: You're Welcome, Joe Flacco. Now Go Somewhere. You're Welcome, Joe Flacco. 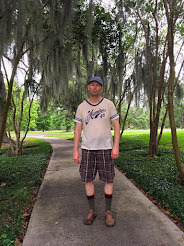 Now Go Somewhere. You're welcome, Joe Flacco. Now go play in traffic. I traded Joe Flacco for a mid-round draft pick in the 2012 draft in my fantasy keeper league. I'd had Joe Flacco since the first year of fantasy football. He was my first quarterback. And I waited like everyone else for him to start playing like he had a set. I won't be rooting for Joe Flacco next year. And in a backhanded way he allowed me to go into the 2013 season with Colin Kaepernick and Andrew Luck as my QB's in a two team league. But if Joe Flacco were to trip over his dog and fall into a meat grinder I probably wouldn't cry. The difference between the Flacco in real life and in Fantasy is that he won the Super Bowl. How did you do in Fantasy. Fantasy football doesn't measure a player worth on the field. If that were the case Detroit would be unstoppable! It went badly in fantasy football. Because Joe Flacco killed me. But this year I have Colin Kaepernick and Andrew Luck, so I have a feeling I won't be fretting losing Ole Frankenstein anymore.